Monitoring made easy: The Packet Power Smart Current Monitor monitors up to six circuits. Housed in a compact enclosure that mounts into a single standard knockout hole (diameter: 33 mm), the design of the unit places a premium on compact size, low cost and installation simplicity. As soon as the monitors are energised, they automatically form a highly reliable wire-free mesh network for a true plug and play installation. The Packet Power Ethernet Gateway automatically detects any new monitoring devices and adds these seamlessly to the network. The monitors communicate via a mesh network routing traffic through any nearby monitors to find the optimal path back to a Gateway. This robust and resilient technology results in a wire-free network that is as reliable as a wired network but much easier to install, manage and secure. Gateways, which can each support up to 150 monitoring units, can be added to expand capacity and provide redundancy. From the moment the monitors are energised, all data is immediately available using the EMX Energy Portal or interfaces with most Building Management Systems (BMS) or Data Centre Infrastrucuture Management Applications. 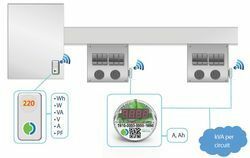 The Smart Current Monitor is a simple and cost effective solution for integration into new busways or for retrofitting to existing ones. Mounted to a tap-off unit, up to 6 circuits can be monitored. The measurements for A and Ah are availble via local a display. When an optional Packet Power wire-free monitoring unit is placed on the end feed, full power and energy measurements (kW, KWh) are available for the end feed and kVA and kVA hours are available for each circuit. The Optional Power Monitor measures power over the entire bus run and provides full energy information including power factor. Improves reliability and availability compared to wired monitors.